We had to catch a lift from San Sebastian due to a knee injury. Ultimately, this delayed us for 6 long weeks in Punta Arenas waiting for recovery. 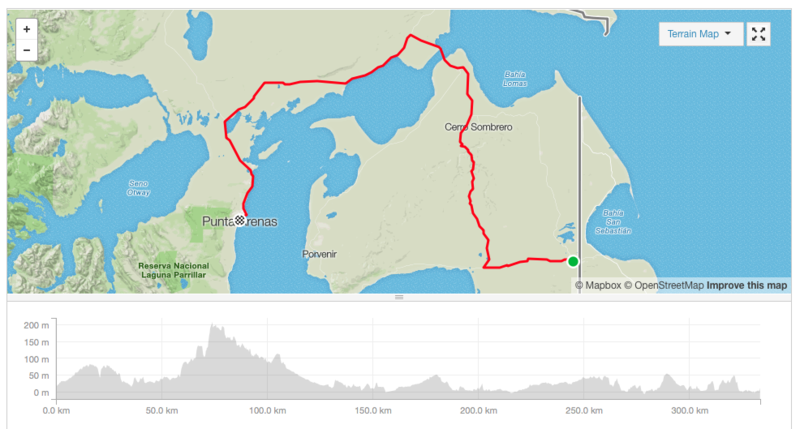 For anyone cycling the route from San Sebastian to Punta Arenas, here is the map and elevations - we would have gone to Ponvenir but the lift we got took us via the route below - the main vehicle crossing route. 13km of rough road connecting the border crossing. You can take only dried food (no meat, fruit, vegetables, or dairy). Reza's knee was much worse so couldn't continue cycling. Slept at this side of the border and attempted to hitch hike the next day. After a long rest in Rio Grande due to Reza's painful knee, cycled to Rio Grande. However, there was a return of the pain. Stayed at the border - there is a room with a cooker and water for travellers. Its also heated! 60 km/hour head wind with gusts of 75 km/hour. Blown off bike 3-4 times into hard shoulder. Had to push the bikes 15km - including downhill. A new level of patience needed. Continued on the rough road with stronger headwinds. Camped on farm land 3km from the tarmac road. This is a rough road, difficult cycling and with a head wind coming off the mountains. We camped at an abandoned hostel right beside the lake. You can make a fire and have clean water but the derelict buildings are eire! At Tolhuin, we went straight to Panderia La Union. This place is a what makes cycle touring so special! A bakery that has a small room with a bed, a bunkbed and some mattresses - free of charge for cycle tourers. On the walls are small stories or names of previous cyclists - making its history felt. Anyone passing should pay homage and stay a night here (or more). You can also help out in the bakery and maybe get some free Empanadas!!! Once over the main pass out of Ushuaia, you see Lake Escondido and an antenna in the distance right by the Lake. About 1km before the police check point, there is a dirt road to the left... take this road down to the Lake (about 1km downhill). Here there is a camping site (no facilities) but there are places to make a fire, fresh water from the lake (we used a filter) and you can also fish here!